Provide comfort for the family of Donna Geer with a meaningful gesture of sympathy. To plant a memorial tree in honor of Donna M. Geer, please visit our Heartfelt Sympathies Store. Sorry to hear of Donna's passing. She was a great person. I have known her for a long time. You are in my thoughts and prayers. As a young teenager, I met my neighbor, Donna. 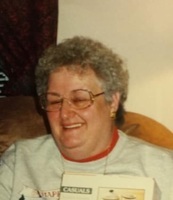 She was a sweet and caring woman with a heart of gold. She saved me from getting in trouble with my Mom by replacing a can of frosting that I had been dipping into for days! She told me to take it home and keep the secret between us! She gave my children a safe place to go, if we could not be home when the bus came, she would wave from her porch and yell "Hello neighbor! ", and send thoughtful gifts at holidays. We took care of her driveway and ramp when she couldn't, and picked up her mail when the walk became to long. Always trying to give us a token of her appreciation, to which we declined each time, she was our neighbor, but more so, our friend. She will be missed by our family, it wont be the same on the turn. I'm sure she has been enjoying her reconnection with those gone before her, and while we will miss her there...she was missed in Heaven too. Many condolences to Donna's family, may she rest in peace.